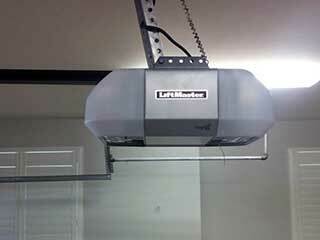 Garage door openers have evolved at a rapid pace, new units are quieter and safer to use than ever before. One of the main differences between them is the type of drive system they use. These mechanisms, whether they use a chain, belt or screw drive system, are required in order to allow your door to open and close automatically. Each one of these units has different advantages, a chain driven system for example is very cost effective and durable but it can be noisier than the others. If you're not sure which type is best for your property and needs, our technicians can happily assist you with this and take you through the range of options available to you. The photo eyes are sensors that use invisible beams to stop your door from closing if there is any obstacle in its path. This is obviously an important safety feature of modern openers as they prevent the door from causing injury or damage. Essentially, the sensors cause the opener to reverse the door rather than continuing to close it on a person or an object. It is important that these photo eyes are checked routinely to ensure they are aligned. Our technicians will thoroughly check every part of your garage door opener during a maintenance check, including the motor gear and circuit board. We'll also be able to realign the sensors if required. Very often your door opener will give some tell-tale warning signs that it is about to break down. For example, excessive noise can often be a sign that it's time to replace the chain drive or alternatively may indicate a worn motor gear. Another early warning sign is when your door appears to have a mind of its own. Maybe it only works on some occasions or starts to open and close randomly. Faults like this can be serious and will probably require professional troubleshooting. If you have noticed these symptoms, it is best to call an expert as quickly as possible - early diagnosis and repair is always better than waiting for an inevitable break down! Sometimes, replacing the unit is the most cost effective long-term solution. Further, replacing the unit may provide a number of added benefits such as enhanced safety and quieter operation. At Garage Door Repair Waxahachie, we offer a wide range of openers from leading brands such as Sears and Genie - our team can explain the difference between each model and the features they offer. We want to ensure you choose the right system for your needs. Whether you are interested in upgrading your opener, require regular maintenance or any troubleshooting, our experts are here to help. Call us today!